If anyone has and uses both. I have considered getting an oreck for stairs. I have and use stepson now. looked ad a booger of a building today. Not a lot of carpet really. but one of the worst as far as access. no water available anywhere in the building. Will be doing it VLM of course. Only two hallways of carpet with 900sq. on each, with carpeted staircases, on one end only. stair carpet is the worst. as it is the first thing that gets trafficked on from the street. really good quality tight loop . with a floral pattern sage color. The stairs have all kind of soiling . Condo assosciation wants new. MGT. talked them int cleaning. Does the oreck with pad/bonnets do as good as a stepson.? both have the same 3/8" orbit i do believe, but the Stepson has the stronger motor i think?? if you don't mind bending over, the Stepson with a stronger motor will do a better job i do believe, since you can push harder on it and the motor won't stop. i prefer to save my back some and stand up while cleaning stairs, so i choose the Orbiter. start at the top of the stairs and, facing down the stairs, clean each step while walking down the steps. you can get the nose really good this way as well. I use the Oreck daily! Works great! like i said, i'm betting the Stepson would do a better job because of the larger motor so you can push on it with your body weight to dig in more. BUT, i've been very happy with the results of my Orbiter on stairs...i've never wished i had something stronger. for me it comes down to: do i want to bend over to clean stairs or stand up...easy answer for me but some ppl don't mind cleaning bent over. I have a modified heavy-duty Gem, same thing as a step-son, with a regular pad driver. The old one didn't last very long. When I cleaning steps I have a spray wand, a hand brush, and a handful of bathmats. Needless to say, it's crowded trying to balance a step-son between your knees or feet while you're finishing off the step with a towel. I don't use it as much as I used to. Easiest thing I've come up with for heavily soiled steps is to spray down the staircase and go over the whole thing with my rotary and a brush first....handle straight up and down, one pass from left to right. That alone usually does wonders. Then, I can go back over them with a hand brush and towels. my GEM is my backup, but it isn't "heavy duty." i never knew there was a heavy duty model?? the normal GEM doesn't have as strong of a motor as the Stepson. 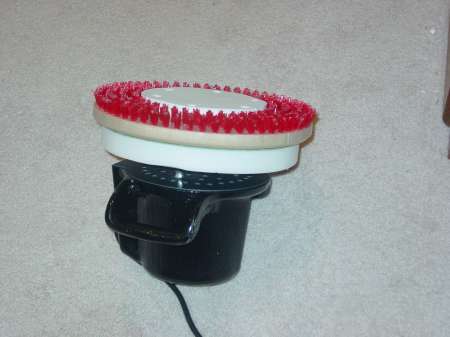 I'm always looking to upgrade equipment to something that is easier to use/cleans better/ Now I am using a Harbor Frieght hand buffer/polisher that sells for $40......which sounds a lot better than $390 for the one you showed the link. But if it work better I'm not totally opposed to investing into one. Do you find that it slings dirt/moisture to the sides? Can you use a MF towel like the size of a handkerchief with one? Hey guys , thanks for all the input. I like the way my stepson cleans. But was wondering if an oreck did as well, and when standing up. I use glads,under the stepson. they are rreally oversize for the tool I think. Planning on getting some of the smaller Ironmans from bonnet pro. first need to confirm that they will work ok under the velcro pad. Barry, I use it with bath mats folded in half -- the bat mats I have now are about 19" X 14" folded in half -- holding the ends and the handles at the same time. Since you're holding the ends it doesn't spin so it can't sling solution around. I wouldn't suggest going smaller. Too small and there's nothing to hold. Just did a filthy set of stairs in a commercial office where the guys come in from the factory. The stairs came out great. I prefer using my Oreck Orbiter because I would rather stand up while doing stairs and I don't like getting my knees wet. I also start at the top of the stairs but I the machine is above me. I've tried cleaning from the top walking the machine down the stairs while I am above the machine but when I do this the pad drive comes off. For the guys doing it this way, how do you keep the pad driver from falling off? Quote: Just did a filthy set of stairs in a commercial office where the guys come in from the factory. The stairs came out great. I prefer using my Oreck Orbiter because I would rather stand up while doing stairs and I don't like getting my knees wet. I also start at the top of the stairs but I the machine is above me. I've tried cleaning from the top walking the machine down the stairs while I am above the machine but when I do this the pad drive comes off. For the guys doing it this way, how do you keep the pad driver from falling off? take the pad driver off and underneath the driver, inside the "cup" apply a piece of duct tape. i cut the duct tape to be long enough to go from 1 inside edge of the cup, to the other inside edge. then attach the driver to the Orbiter and it's now a tighter fit and will never fall off....once in a while it might when pulling off a pad. EDIT** if you find it is too tight a fit, take it off and remove some of the tape by shortening it. Current time: 04-20-2019, 02:09 AM Powered By MyBB 1.8.17, © 2002-2019 MyBB Group.